Properties in Prague average 4.3 out of 5 stars. Sunny apartment near the center. Property 3: Sunny apartment near the center. 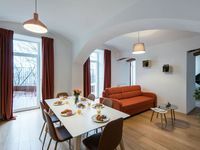 Property 10: In Centre Prague Large Flat Design/Old town in 10 minutes,tactical area,8 BEDS! Property 11: Unique Havelska Market HideAway, Peace, Tranquility in Heart of Old Town. Property 13: New reconstructed building Wenzigova at walking from public transport and famous area ! Property 21: New reconstructed building Wenzigova at walking from public transport and famous area ! Friday Songs' Luxurious 1 bedroom Apartment by Charles bridge and Prague Castle. Property 25: Friday Songs' Luxurious 1 bedroom Apartment by Charles bridge and Prague Castle. Property 34: Sunny Spacious Condo in town centre, Close To Transport, Fun And Tourism. Property 47: Great Old Town location.